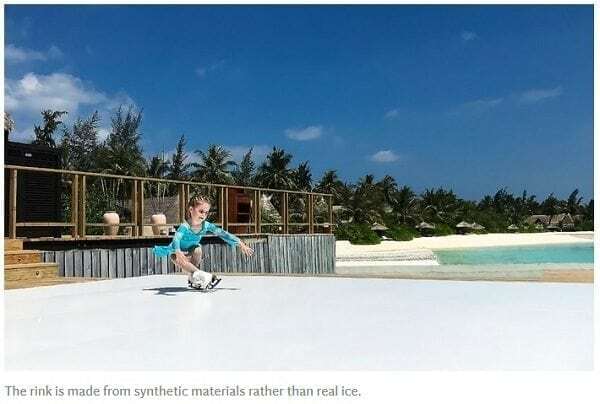 “The Glice® rink is actually made of a material which looks like ice, it feels like ice, but it’s not ice. It’s 100 percent ecological. It doesn’t need electricity and it’s a lot of fun,” said Glice co-founder Viktor Meier while visiting a recent installation in Sioux Falls. Watch the KELOLAND News clip to see more! Since last week the 5 star hotel Louis C. Jacob in Hamburg surprises its guests with a novel entertainment twist – a synthetic Eisstock track by Glice® including views onto the Elbe river. The TV crew from NDR Hamburg Journal visited while the newly installed Eisstock track was inaugurated by the hotel’s staff. The rink is made of a synthetic plastic known as Glice®– a material composed of heat-pressed layers of polymers. BROOKFIELD, IL – Guests venturing out to Brookfield Zoo this winter can now lace up their ice skates. The Chicago Wolves and the Chicago Zoological Society, which manages Brookfield Zoo, are teaming up to unveil a new temporary addition to the zoo – a skating rink. The zoo said the 40-foot x 80-foot rink is located on the zoo’s East Mall and will be open daily from noon to 4:30 p.m. for zoogoers starting Saturday, Nov. 3, and closing for the season Jan. 27, 2019. Throughout the zoo’s Holiday Magic festival, the rink will have extended hours from 10 a.m. to 8:30 p.m. 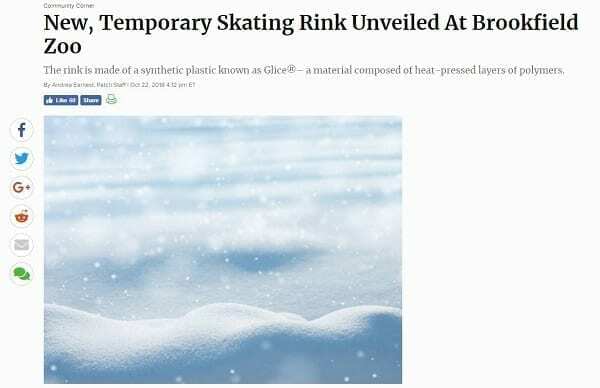 The zoo said the rink is made of a synthetic plastic known as Glice®– a material composed of heat-pressed layers of polymers – so no water or electricity is required for operation. Brookfield Zoo joins Detroit Zoo and Columbus Zoo as the only zoos in the country to install a Glice® rink. The cost for unlimited time for all skaters on the rink is $7. A limited number of skates are available to rent for a $5 fee. Skaters are welcome to bring their own skates. The future is here – and it’s not all drones, Big Brother style CCTV coverage and tiny microwaveable meals. It’s called ‘ice skating without the ice’. 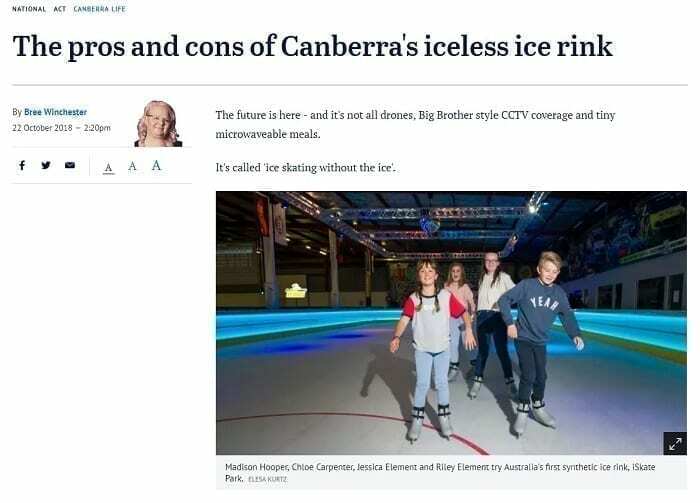 As someone who feels the cold deeply, I was beside myself when I found out there is now a synthetic ice rink in Canberra (okay it opened in February, but I was busy having my portrait painted and finding Canberra’s best potato scallop). However, there are pros and cons to visiting iSkate Park – located at Fyshwick’s Powerkart Raceway. I’ve done the research for you. The synthetic surface – which was shipped to Canberra all the way from Swiss company Glice – is actually self-lubricating plastic. ‘No water or electricity required to run your rink,’ the Glice website says. But it’s so close to ice it’s scary. Like it even has that dirty area where people enter and exit the rink. At approximately 300sqm, iSkate Park is less than a quarter of the size of a traditional ice rink, so for those kids whose version of ice skating looks like laps clinging to the barriers surrounding the ice, it just means gliding past mum and dad more often. Viewing the rack upon rack of brand new, identical, grey Glice boots is just so satisfying. The boots don’t smell and they have no laces. So kids can put them on by themselves. Arriving at iSkate Park is like stepping back to the 1980s roller – or ice – rink of your dreams. (For me it was the Blue Light Roller Disco at the Queanbeyan YMCA.) Think neon, a giant disco ball, dimmed lighting and a soundtrack starring Toto, Madonna and Queen. iSkate Park is basically the kids’ version of my favourite 80s bar, 88mph. BIG TICK. I was there at night and it was cool but definitely not ‘I can see my own breath’ cold. The kids wore T-shirts and jeans. As a spectator, I didn’t have to put on eight million layers and a beanie. iSkate is a winter wonderland, without the winter part. My kids and their friends fell over just as much as they would have on real ice but bruising was non-existent and there was no guttural ‘ugh’ as they landed on the synthetic surface. When the kids pick up their boots, they’re still given the ‘fall with your fists closed’ safety talk. I honestly thought the boots would be entirely plastic. Not so. I jumped a mile high when my stunning rendition of Electric Dreams was interrupted by the squeal of six power karts starting a race. But hey, the name of the activity is literally iSkate Park at Power Kart Raceway so I probably could have tried harder to manage my expectations. The verdict: A great treat for the kids and definitely novel. Make sure you take extra cash as they’re guaranteed to want to do glow-in-the-dark Jungle Golf or race the power karts afterwards. Blue Jackets forward teams with local business owners to open high-tech training center for developing hockey players. 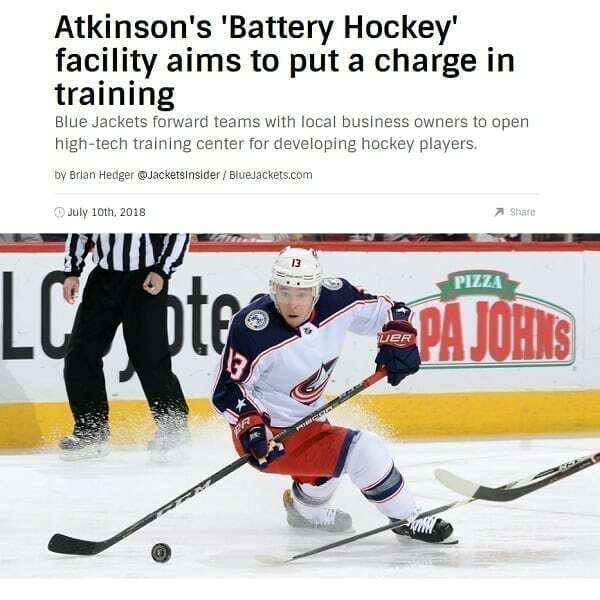 The idea for Columbus’ soon-to-be new hockey training facility, The Battery Hockey Academy, didn’t just materialize out of thin air. It materialized in cool air, which just wasn’t cool enough to maintain an outdoor ice rink at Jason Ohlson’s office in New Albany. Ohlson’s frustration was given a synthetic solution, called Glice, and that eventually spun off into plans for “The Battery” – a training facility for hockey players that plans to open in September at 8515 Rausch Dr., in Plain City. Especially the synthetic ice, which was the initial solution for Ohlson’s melting rink. Ohlson learned about it from Matt Dickson, a local emergency-medicine doctor and another part-owner in the venture. Dickson had a strip of Glice installed in his garage, for his sons to practice shooting pucks, and he remembered Ohlson’s soggy rink. Ohlson checked out the strip himself and soon contacted Glice’s North American representative – who just happens to be Dan Fritsche, a former Blue Jackets forward. They discussed Ohlson’s outdoor rink, but the idea for The Battery Hockey Academy soon took over – forming as a collaboration of hockey dads, a local youth coach and Atkinson, who heard about initial plans during a charity dinner with Ohlson. The Battery Hockey Academy is housed in a warehouse that was once used to construct 50-caliber bullets for the U.S. military. Its large open space was perfect for how its new owners planned to use it. Inside, will be a 75-foot by 55-foot studio ice rink for individual and team instruction, along with a 60-by-60 synthetic Glice rink to be used for stations focused on stickhandling, shooting, body positioning and even body-checking. There will be a room to hold team video breakdowns, a state-of-the art weight room for off-ice training and even a kitchen for teams that might want to host meals there. Open to all ages, the main attraction is a circuit-training course using hockey skills, designed specifically to help individual players improve their skills. Instruction will be handled by a roster of coaches assembled by Joey Nahay, director of hockey for the Capital Amateur Hockey Association (CAHA), who will lead instruction and is another part-owner. “I looked at it like, ‘I’m going to solve a problem and I’m going to be first to market, best to market, and we’re going to develop a circuit-style training environment,'” Ohlson said. “So, if a kid comes to us and he’s 8-years old or he’s 18-years old, you’re going to come in and go through the ‘Battery’s circuit: 20 minutes on the ice, then 20 minutes over to the Glice and stickhandling and positioning and body checking and all that, and then another space where you get rotated over to the shooting area. You could also use the skating studio. It will be a unique experience, to say the least. At least, not until August. The plan is to hit the ice in stride about a month from now, after the Glice rink is installed, the studio rink is finished and the weight room is complete. The Columbus hockey community is already buzzing, according to Atkinson, who said some of his Blue Jackets teammates are fired up too. It should fit right in the local hockey scene, considering the growth in popularity of the sport in Columbus. Atkinson has witnessed that growth the past seven years, since making his NHL debut in 2011, and his goal is to fan the flame. He’s since gotten married, bought a house, signed a long-term contract extension and is set to become a father for the first time within a matter of weeks. Fostering the local hockey scene is high on his personal agenda. Is this the most unlikely place for an ice rink? (CNN) — A tropical island nation in the Indian Ocean, the Maldives is best known for its 1,000-some islands and over-the-top experiences. The Conrad Maldives Rangali Island offers an “Instagram Butler” service and an all-glass, underwater restaurant; Soneva Jani provides private water slides for all its overwater villas; and The Private Reserve is the world’s largest overwater villa. But this spring, there’s another reason to visit: the destination‘s first ice rink. Dubbed “Ice Ice Maybe…,” the1,829-square-foot (170-square-meter) rink opened in March at the Jumeirah Vittaveli resort, located about 20 minutes by boat from the capital of Malé. 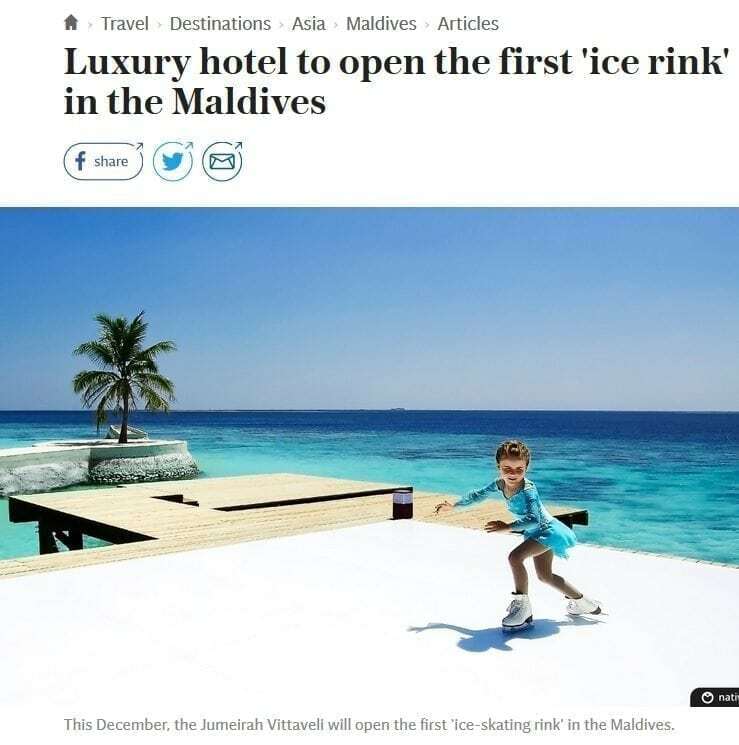 “We named it ‘Ice Ice Maybe…’ to imply that it’s not a traditional cool-down ice skating rink,” Amit Majumder, general manager of Jumeirah Vittaveli, tells CNN Travel. The idea for the ice rink first began percolating in December 2016, right around Christmas time. “We had some regular guests who have been staying with us for many years now,” says Majumder. So Majumder set out to deliver the best of both worlds. “The project was challenging in the Maldives — it’s not like Europe, where people already know about ice rinks,” says Majumder. A non-negotiable component of the project was finding an environmentally friendly solution. “While researching, we actually visited a few real ice rinks,” says Majumder. To keep a conventional rink frozen, you have to refrigerate it, which requires constant electricity and water. Instead, the hotel enlisted Swiss company Glice to build an artificial, zero-energy rink. “A regular guest, whose daughter ice skates, told us about the synthetic Glice ice rink,” recalls Majumder. Composed of 25-30 interlocking plastic ice sheets, the rink’s synthetic sheets — made of silicon and plastic — do not require chilly temperatures to produce that gliding sensation. As such, the rink can withstand the fiery Maldivian temperatures, which hover around the mid-80s Fahrenheit most of the year. “Some people assume it is going to be cold, since it’s an ‘ice’ rink, but that’s not the case,” says Majumder. At first glance, the ice rink looks like any other Maldivian villa with its wooden stilts and thatched roof. “We wanted to blend the rink into the architecture of the Maldives,” says Majumder. A fast favorite among families, in particular, the rink is exclusively available to hotel guests. “We try to keep the experience as private as possible for the residents on the island,” says Majumder. For hotel guests, each two-hour skating session ($75 per person) includes skate rental, protective gear, souvenirs and an ice cream sundae afterward — to ensure you’ve properly cooled down before gliding back to the beach. Tea parties with elves, real reindeers, an enchanted Village, a Yuletide Square and Snowy Forest, craft fun, tractor rides…oh and meeting Father Christmas. And all of this festive fun is happening in one place. At Avon Valley Adventure & Wildlife Park, starting from Saturday, November 25 until Sunday, December 31, there is festive fun for all the family. And this year, for the first time ever, they are introducing a Glice Rink. As the name suggests, this is similar to an ice rink but with synthetic ice. This means you can enjoy all the benefits of ice skating but without a soggy and wet ice rink. The rink will be limited to 45 people so there will never be overcrowding. Fancy throwing some shapes on the glice? Between 6.30pm – 9pm on selected evenings, there will be a Glice® Disco Party for older children and families. If you are a bit wobbly on you skates, fear not. Non-skating guests are free and can enjoy a hot chocolate or mulled wine and grab a bite to eat in the food area. Go on an adventure across land and sea with Evergreen the elf to visit the North Pole. This 90-minute experience will take you on a magical journey to meet Father Christmas. In a group no larger than 5 children with accompanying adults, you will be transported to the North Pole to meet some special characters including Patch the elf, Mrs Claus and Father Christmas himself. Each child will receive an age appropriate, personalised present from him. The elves are hosting a tea party and everyone is invited! Enjoy platters of sandwiches, cakes, squash and more before Father Christmas arrives to tell a magical story. Afterwards, there will be the opportunity for them to tell him why they should be on his nice list! Each child will then have the opportunity to have a photo with Father Christmas, where they will also be presented with a certificate and balloon to show they have met the real Father Christmas. What else is going on around the Park? Everyone visiting the park will be free to explore the Enchanted Village, Yuletide Square and Snowy Forest and enjoy some elf craft fun. Is your little one nuts about tractors? Enjoy a Festive tractor ride or a trip on the polar express miniature railway and meet real reindeers Donna and Blitzen. There will be a snowman trail around the park & nativity scene, making your trip to Avon Valley a fun festive filled day to remember! Winter is coming early to the Maldives this year with the opening of the country’s first ‘ice-skating rink’. The attraction has been conceived by Jumeirah Vittaveli, a luxury island resort situated a 20-minute catamaran ride from the capital, Malé. 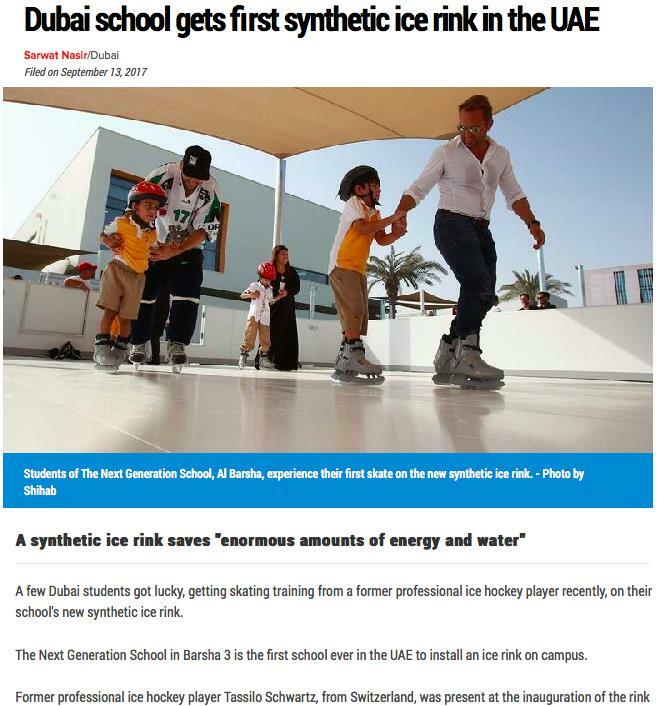 However, unlike most artificial ice rinks, which are created by freezing a layer of water over a base of concrete (a process that requires a lot of power), the Jumeirah’s rink will be made entirely out of synthetic materials. Using artificial ice plates made out of plastic, developed by leading Swiss company Glice®, the rink will reportedly not require electricity or water to operate. It is set to open at the beginning of December – a month when temperatures across the islands average around 27 degrees Celsius. “The ice rink is a perfect expression of our goal to always wow guests,” says the hotel’s General Manager, Amit Majumder. The hotel, which is part of the Dubai-based Jumeirah Group, comprises a collection of 43 thatched villas. Each faces onto the beach and comes with its own private garden and pool. The seven Ocean suites are even more secluded, with each one accessible only by boat. A stay in the ultra-exclusive Royal Residence, meanwhile, at a vast 3,500 square metres (equivalent to two thirds of a football pitch), includes use of a private restaurant, gym, spa and team of staff. It costs US$35,000 (approx. £26,290) a night. Facilities at the hotel include an Asian-inspired spa and a ‘house’ coral reef. An on-site water sports centre offers snorkelling equipment and diving trips, along with jet-skiing, windsurfing and deep sea fishing. The addition of an ‘ice rink’ marks the start of a packed festive season at the hotel, which will be celebrating with gala dinners on the beach, a visit from Father Christmas on Christmas Day, and a New Year’s party on December 31 featuring DJ sets, fireworks and a live fire dance. 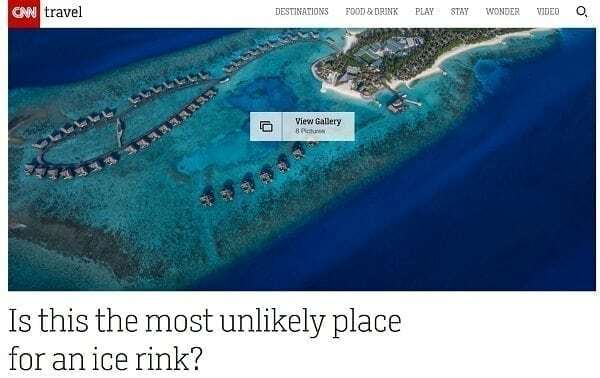 The rink is just the latest extravagant project conceived by the Maldives’ plethora of luxury resorts. The region currently boasts several underwater restaurants – Hurawalhi claims to have the largest – and there’s a sub-aquatic spa at Huvafen Fushi resort. With their futuristic technology Glice® synthetic ice rinks are the beginning of a new era in ice sports and recently caught the attention of the International Association for Sports and Leisure Facilities (IAKS). 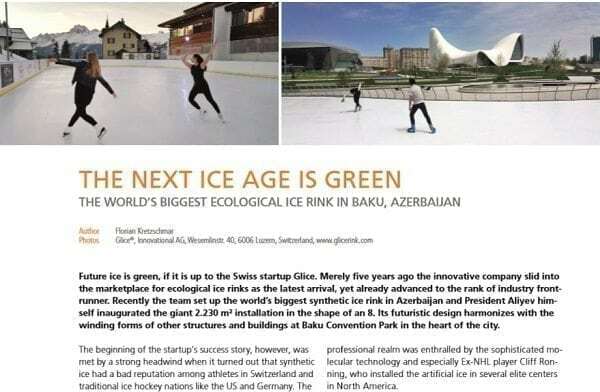 In the latest issue of its sb Magazine IAKS reported on the world’s largest synthetic ice rink, installed by Glice® in Azerbaijan, and the company history behind the fascinating product. Future ice is green, if it is up to the Swiss startup Glice. Merely 5 years ago the innovative company slid into the marketplace for ecological ice rinks as the latest arrival, yet already advanced to the rank of industry frontrunner. Recently the team set up the world’s biggest synthetic ice rink in Azerbaijan and President Aliyev himself inaugurated the giant 2.230 m² installation in the shape of an 8. Its futuristic design harmonizes with the winding forms of other structures and buildings at Baku Convention Park in the heart of the city. The beginning of the startup’s success story, however, was met by a strong headwind when it turned out that synthetic ice had a bad reputation among athletes in Switzerland and traditional ice hockey nations like the US and Germany. The plastic ice that existed back then had a meager glide-effect and simply couldn’t replace real ice under the blades of professional athletes, even if the idea was utterly inventive: Contrary to conventional ice, the ecological variant devours neither electricity nor water so that the ice-skating fun is much more pleasant for the environment and operators’ wallets. Hence, the company’s founders Toni Vera and Viktor Meier were certain that green ice was the signpost pointing towards the future of ice sports. A former ice hockey pro himself, Vera knew exactly what matters on the ice and together with Meier and a team of engineers he developed a technology that would rewrite the physical laws for synthetic ice and revolutionize the industry: ecological ice from athletes for athletes. The professional realm was enthralled by the sophisticated molecular technology and especially Ex-NHL player Cliff Ronning, who installed the artificial ice in several elite centers in North America. The conviction of professional athletes that Gice ice meets their standards also brought the leisure industry into play. Spaniard Vera was abundantly aware of the issues related to real ice in warmer climate zones. Yet, thanks to its zero-energy characteristics, the ecological counterpart functions completely climate-independent, all year around and worldwide, even in the desert and in the tropics. As a seasoned globetrotter Meier brought in the marketing expertise for Glice to export its miracle-ice even into countries that had never seen a pair of skates before – in malls, hotels and private households Glice-ice made its appearance and became a people magnet during the 2016 Olympic Games in Brazil. By now the company distributes its product into 70 countries on 5 continents.